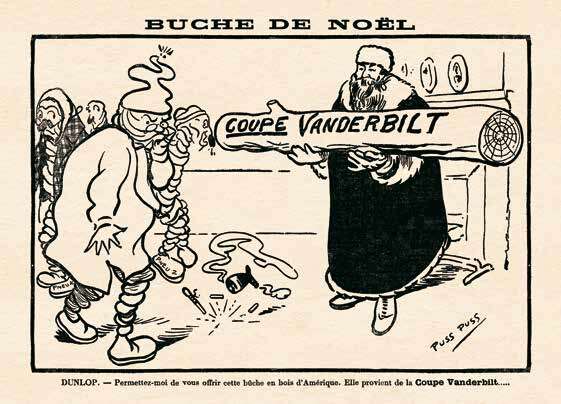 In this post, Pau highlights a humorous advertising battle after Dunlop helped win the 1905 Vanderbilt Cup Race with their tires. Professor Pau Medrano Bigas: The English translated version of my Thesis Dissertation is now available online at the University of Barcelona Thesis Depository. The pdf files has been prepared and designed to be printed on paper. The Thesis can be downloaded separately by chapters, where the images appear reproduced in full color and in good resolution. Files with the covers/back covers of the four volumes are also provided. It is made with the intention that everyone can print it on paper and bind it for your own enjoyment. Please communicate its availabilty to all those who may be interested. You can take images and post them on your wonderful website. It will be nice to share the results of my research to all automobile history lovers. The English translation was funded by the late Bruce T. Halle (founder and owner of Discount Tire Co.) who passed away last January 2018. In addition to the two pdfs devoted to tires in races (Chapter 16), I recommend reading the foreword and the index. I look forward to receiving feedback from your viewers. I hope they enjoy it! 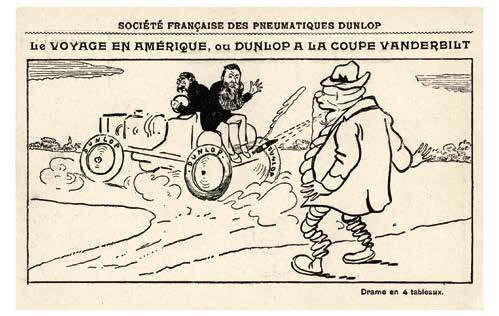 The second Vanderbilt Cup Race, won by driver Victor Hemery riding a Darracq car on Dunlop tires, was a warning to Michelin’s aspirations. 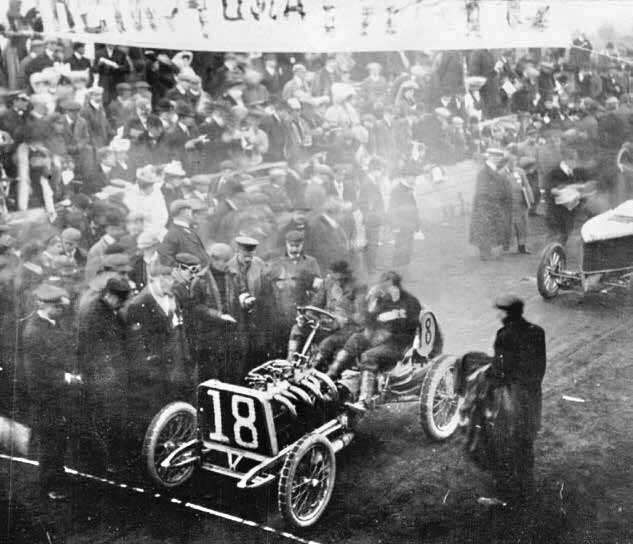 The 1905 race was a lapse that Michelin quickly rectified, but the British company Dunlop did not pass up the opportunity to use it as a promotional victory. 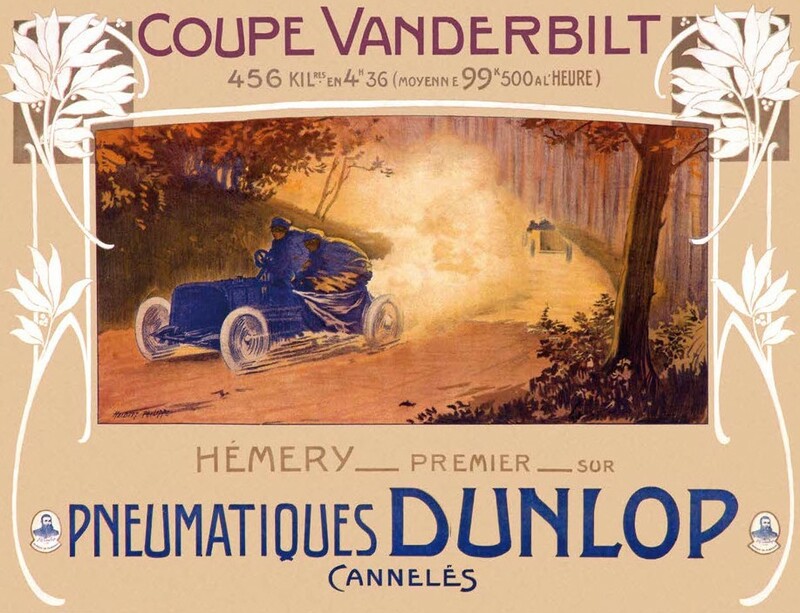 The poster shown here commemorates the victory of the racing driver Hémery using Dunlop tires in the 1905 Vanderbilt Cup, which the manufacturer’s French subsidiary printed out for the local market. Only one existing poster is left, the one shown here, reproduced for the first time with permission of the private collector who owns it. The 1905 race was a lapse that Michelin quickly rectified, but the British company Dunlop did not pass up the opportunity to use it as a promotional victory. 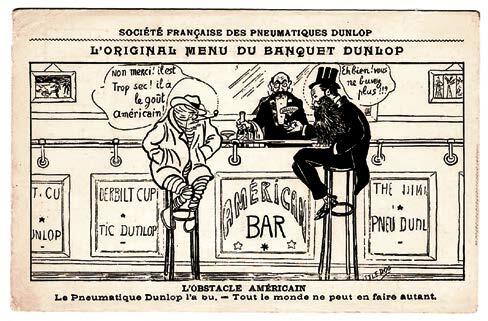 Their French subsidiary published a series of humorous postcards celebrating the triumph in American lands against their great rival Michelin. Michelin won the first Vanderbilt Cup in 1904, beating other brands that equipped vehicles from the participating countries. Once again, this time in American territory, Bibendum claimed victory over their despondent rivals, tires “X” (Dunlop) and “Y” (Continental) both of which were mocked in Michelin’s aggressive compara- tive advertising. The following year, another passenger accompanied Bibendum in the victory of the second Vanderbilt Cup (John Boyd Dunlop). 111. 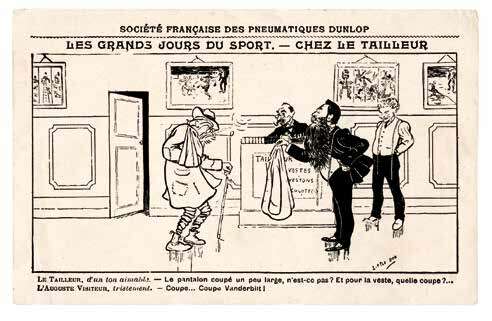 First postcard of the series Drame en 4 tableaux, published by Dunlop’s French subsidiary, 1905. 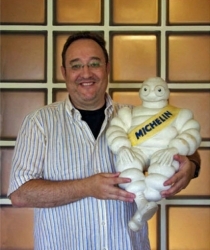 If the mascot Bibendum represented the firm Michelin, a portrait of John Boyd Dunlop did the same with the company bearing his surname. In a striking blow, Dunlop convinced the pilot Victor Hemery to fit his Darracq with Dunlop tires. Hemery was competing in the French team, and in theory it was permissible to use Dunlop tires … provided that they were made in France. 112. Second postcard in the series Drame en 4 tableaux, published by Dunlop’s French subsidiary, 1905. In the illustration, a laureated and almost divine Mr. Dunlop is portrayed floating on a cloud. He is holding onto Victor Hemery, the brand- new winner of the race, who exclaims: “I won the cup thanks to Dunlop.” Bibendum turns his back on the scene, not in the mood for celebrations. Aged and dejected, he blows out air, becoming deflated as a sign of discouragement. 113. Third postcard in the series Drame en 4 tableaux, published by Dunlop’s French subsidiary, 1905. 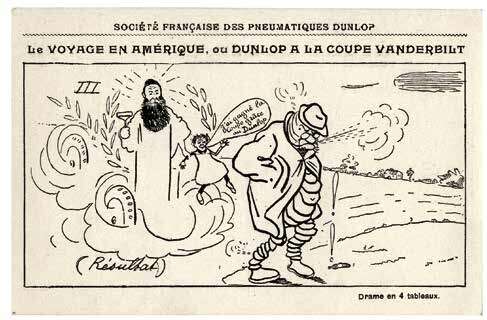 Uncle Sam hands over the Vanderbilt Cup to Dunlop, while offering the peace pipe —another indisputably American symbol— to the previously energetic and battling Bibendum. Clearly affected by defeat, he gapes open-mouthed —his cigar dropping—, at the ascension of his rival. In the background, to the left, the racing pilot Victor Hemery applauds the act. A practically deflated Bibendum is still puffing while smoking the peace pipe. In the background, the smiling sun and an exhilarated Statue of Liberty announce the dawn of a new era. In the foreground, a relaxed Mr. Dunlop sits calmly in his chair while smoking a cigar for the first time in the series, a sign of opulence that had once been reserved only for the haughty Michelin mascot. 115. Fourth postcard in the series Drame en 4 tableaux, published by Dunlop’s French subsidiary, 1905. 116. Fifth postcard in the series Drame en 4 tableaux, published by Dunlop’s French subsidiary, 1905. A deteriorated Bibendum goes to a tailor—Mr. Dunlop—who has taken his measurements. The dialogue reproduced in texts at the foot of the illustration is a play on words of the French polysemic meaning for coupe, referring to the Vanderbilt Coupe [cup] and the coupe [size] of Bibendum’s clothing. In the background, behind the counter, the driver Victor Hemery appears once again. 117. Sixth postcard in the series Drame en 4 tableaux, published by Dunlop’s French subsidiary, 1905. 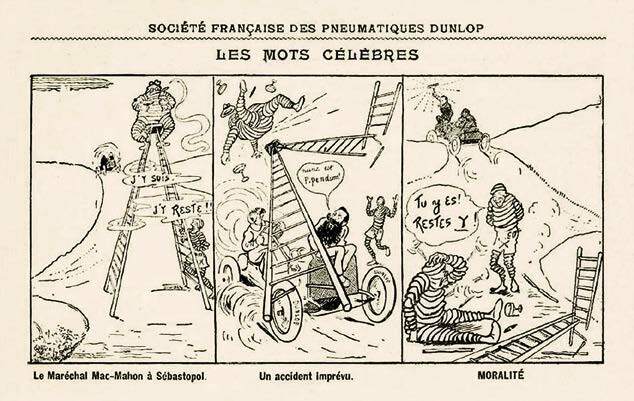 The image on the left is the eleventh advertisement of the campaign entitled “Mots Historiques” by Michelin, which contains famous phrases illustrated by O’Galop. 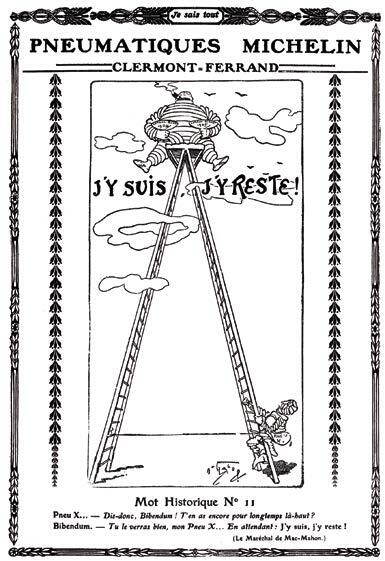 In this case a fully inflated and robust Bibendum sits atop a long ladder, holding in both hands the trophies obtained in the 1904 and 1905 Gordon-Bennett Cup competitions. At the bottom of the ladder we see a debilitated man-tire, marked as Pneu X, trying to ascend the first rungs while looking at the inaccessible leader. The sentence “J’y suis, j’y reste!” [I am here and I will remain] is attributed to the Marshal of the French army —and President of the Third French Republic— Patrice de MacMahon, who presumably declared it after taking a strategic defensive bulwark, the Malakoff tower, on September 8, 1855 during the Siege of Sevastopol in the Crimean War. 118. Michelin’s full page advertisement published in the magazine Je Sais Tout, 1905. 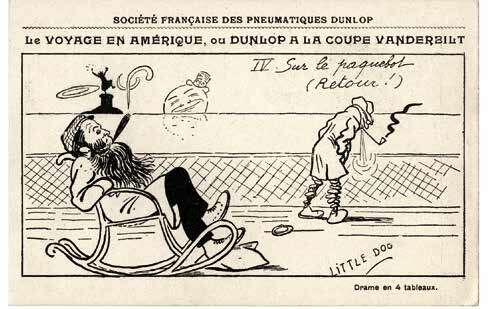 Thise image depicts the humorous postcard published by Dunlop which parodies the above scene. The 1905 Vanderbilt Cup winner Darracq, led by Hemery and with Mr. Dunlop as copilot, topples the ladder standing in the middle of the road. Bibendum falls to the ground from his watchtower, and the pneumatic man X jabs at him: “Tu y es, restes-y” [You are there, there you’ll stay], thus making him see that he is now no longer the reference, but has been replaced by another competitor: the triumphant Dunlop, baptized as ‘Tire Y’ (underlined)! 119. 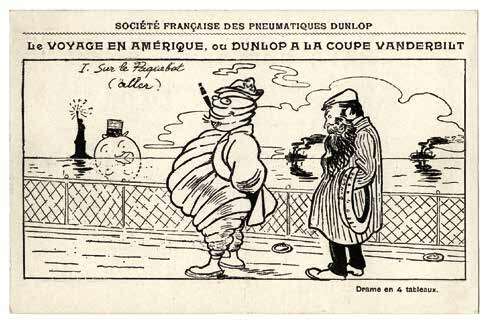 Postal letter parodying Michelin, published by Dunlop’s French subsidiary, 1905. (Mr. Dunlop) “—Allow me to offer you this American wood trunk. 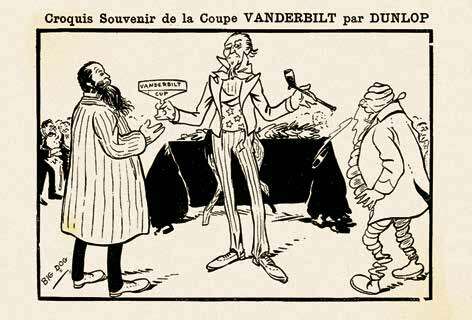 It comes from the Coupe Vanderbilt.” The French word “coupe” refers to a goblet and trophy but it also means the logging of trees. Thus the joke consists of this play on words. sports journal L’Auto, December 24, 1905. Mr. Dunlop was a Veterinarian.